Kids should have the right to question their parents. How else are they expected to learn? I want kids to be aware of my fallibility, to think for themselves, and to believe there are other ways to accomplish tasks beyond the way I direct them. But there is one caveat about their free reign to question me–they can only do so AFTER they obey. One of the most common mistakes parents make is to allow our children to debate with us rather than obey us. It’s a classic tool used by children. Very early in life, they learn that if they can draw us into a conversation about our directive, there is a good chance they can get out of having to do what we say. Kids do it because it works. Primarily, kids bickering with parents happens because it’s how the parents interacted with their parents. Because it’s how we grew up, we just assume that’s the way things are. The stereotype is about the stubborn two-year old throwing a tantrum or rebellious teenager yelling at his mom and we don’t realize it doesn’t have to be that way. While we can’t control their behavior, we do influence it. And more importantly, we get to choose what role we will play in the relationship. Having grown up with this model, we naturally engage our children when they desire to debate rather than obey. They might start it, but we join in. We tell them to obey which triggers the debate. Rather than expecting obedience, we expect a verbal kick-back. When our expectations are realized, the fight begins. Sadly, it feels right. Fighting with our kids feels like parenting. We think we are holding the line and doing what we are supposed to do. We can quickly swap stories with our fellow parents with everyone having a story of the latest battle. Never to yell at our children. Never to fight with them. Never to allow their actions to dictate our emotions. We don’t have to yell. We shouldn’t yell. Yes, we can raise our voices to get their attention when they upstairs or outside, but there is no excuse for yelling at a child. Yelling is childish behavior and parents should act like adults not children. We don’t have to fight with them. A fight implies the outcome is in question. If I win, I get my way. If you win, you get your way. If I made suggestions, we can discuss them. But if I have given a directive, it must be obeyed. We can’t fight over my instructions. If a child chooses debate over obedience, they must experience the negative consequences of their disobedience. We don’t have to give emotional control to our children. The only negative consequences most children experience when they disobey is the emotional distress of their parents. They disobey and we get upset. Maybe we yell. Maybe we get angry. But often we experience the consequences for their disobedience. That gives them no motivation to change. Instead of fighting with our children, we should lead them. Sometimes we fight with our kids because we don’t want to take the time to talk with them. It can be easier to yell than to take time and answer their questions. This should be a parenting rule: We are willing to answer every question you have after you obey. We won’t do it before, but once you obey you get to ask anything. This empowers our children to know what we are thinking and to know they have a say in what happens to them. But it does not make them believe they can manipulate us out of holding them accountable. 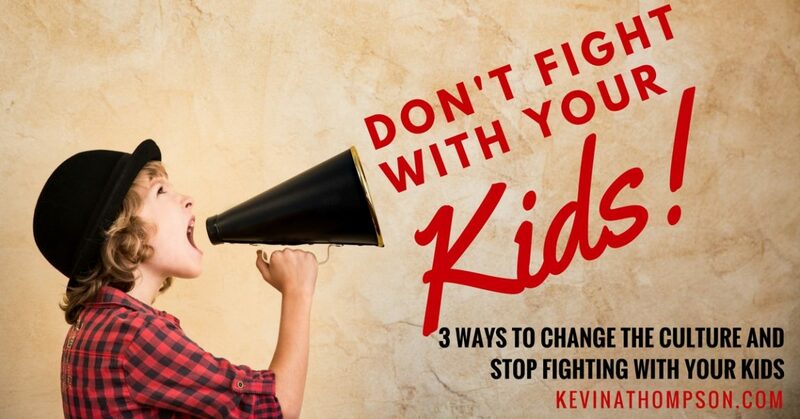 If we are in a pattern of fighting with our children, how do we change the culture? 1. Take responsibility for how things are and commit to change. 2. Apologize to your kids for what you have done wrong and explain the new procedures. 3. Create a new culture. This requires humility, time, effort, and education. You are certain to fail. Your kids will fail. It will be tempting to relapse into old habits. But change is well worth it. You give a directive to your child and debate instead of obey. What happens? Remind them of the directive. Announce the second consequence if they continue to disobey. There are two key points for this to work. 1. You must resist the temptation from making big threats. Too often, parents make big threats which they could never enforce. Don’t threaten to pull the car over unless you are willing to pull the car over. Don’t say you will fill in the pool with concrete unless you have already called the concrete company. Appropriate, reasonable, and scaleable consequences are important. 2. You must hold your kids accountable to the consequences you announce. Every time you fail to do as you say, you are training your kids to ignore you. Even if you feel bad about the consequence you announced, apologize, tell them you will do better next time, but then hold them accountable. Kids and parents fighting might be a part of life, but it doesn’t have to be as regular a part of daily life as many families experience. It is possible to raise kids without fighting with them incessantly. Whether or not they obey is up to them, whether or not there is a fight is up to you. How do you do this if your spouse is not willing to make the same change? Ultimately, you can only control you. In many situations, if you make the change, your spouse will eventually begin to ask why your child acts differently for you. Great article. I wish I parented like this from the beginning. The older your kids get the harder it will be to implement this.